The idea of being in a situation where one feels that they are associated with another to be point of feeling their presence even in their absence is one that could fairly be described as bittersweet: knowing that there is another that one cares for in a manner that transcends geography and other constrains should be something that someone would be appreciative of, all the while cursing that their situation keeps them apart from the so loved. Entwined‘s opening statement of “always together; forever apart” underscores this sentiment and the message of the game wholesale in a way that is rarely so consistently implemented in a ludonarrative sense. 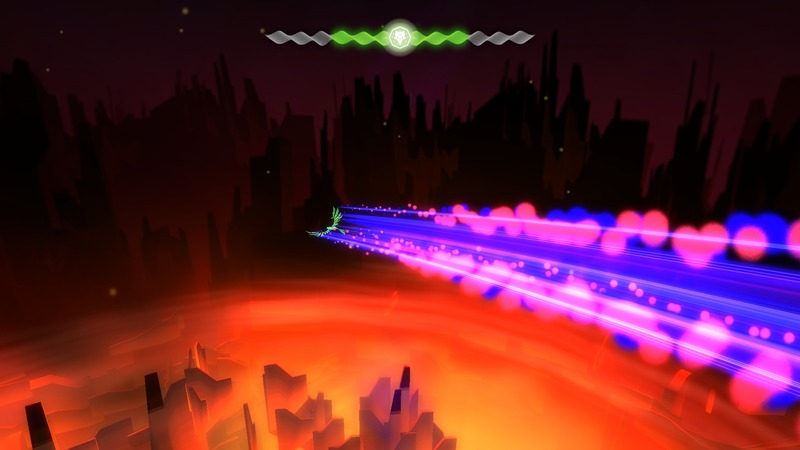 The game’s colour scheme is bold and bright. While it is a simple piece of metaphor through play, the split of the control of the two souls, as represented by a bird and a fish, across halves of the two analogue sticks does much to convey the sense of these two entities moving in a complimentary manner, if not in sync, in spite of their inability to actually come into contact with each other. The complementary oranges and blues of the zones through which the entities must be directed furthers this idea, with the melding of these colours to greens occuring where the fish and the bird must come close. This simple visual language is not any less poignant for its simplicity: these is representative of what, I hope for my own sake as well as that of others, fairly universal human feelings codified by visual metaphor. The contrast of experience when apart; the shared experience of traveling to see one another; and the eventual appreciation and melding of experience as those fated for each other meet: while trite and ground that has been trodden many, many times over the years, the way in which this is put across in Entwined is beautiful. 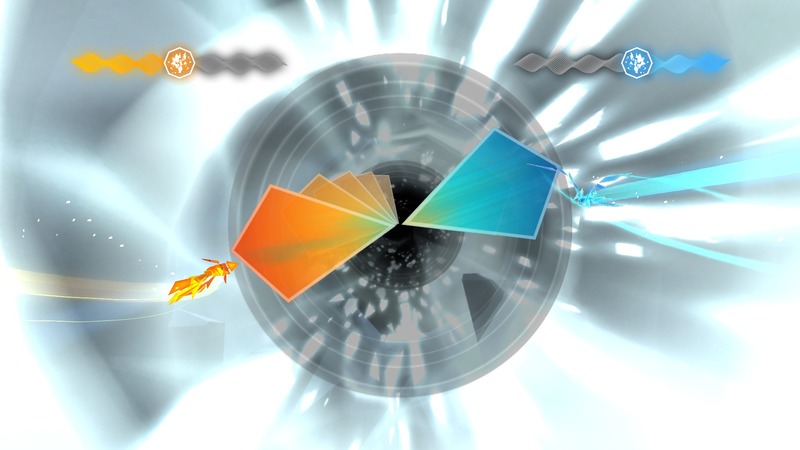 Each level of the game represents a lifetime for the two souls seemingly so fated to be together, with the goal being to accumulate enough floating orbs to fill both the left and right entity’s bars before then navigating obstacles successfully until the two entities are in a position to merge beyond the sum of their individual parts, forming a green dragon-like creature. Errors in navigating the two characters through their respectively coloured obstacles lead to a diminished energy bar, much as an ill-timed lack of funds may prevent a previously planned excursion with a loved one from occurring, delaying the wonder that is a merger of two entities into something greater than the sum of themselves; an intolerable reminder that not everything is simple even though the fact that love for another thing may be the simplest thing of all to conceive of. The merger of fish and bird is always met with a certain gravitas. Growth never stops at the coming together of lovers of course: the merger is merely scope for further, mutual growth. Again we are in the business of filling bars, exploring together to gather the requisite resources to remind ourselves what our love actually means for us in the flesh. We remember through all of the little acts, the grazes of skin against skin, the recollection of stupid jokes and the more deliberate physical actions; we remember through all of the resurfacing of specific insecurities, recollection of feelings of loss in the absence of the other and through memories of the transience of the pure feeling that we feel in the moment: we remember this and celebrate the present and soar as on wings. Entwined‘s dragon skywriting is just that: a demonstration of the love felt between two entities: noisy, bright and explosive. We reach these climaxes but we must part at some point: the cycle starts again. We must traverse our own obstacles once more until we can be together. 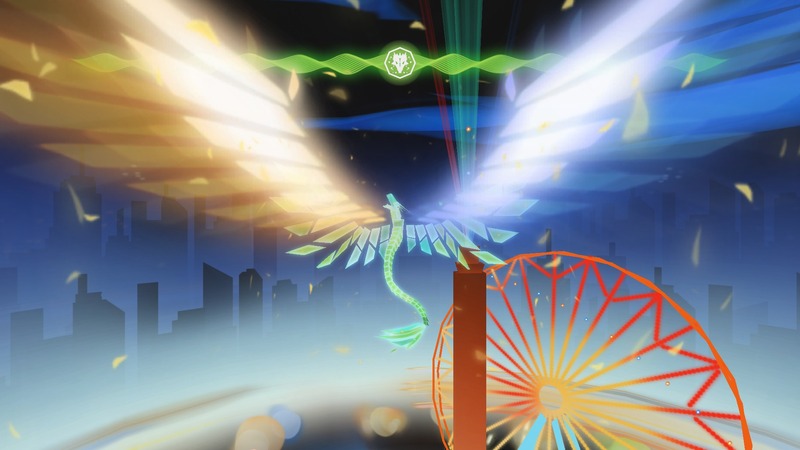 Entwined‘s element of environment alteration is gorgeous. It’s not just visual language that puts this across so well: the sound design of Entwined hammers this home too. As one progresses through each of the lives of our creatures, the music increases in volume and tempo, developing a thicker timbre. Excitement and apprehension are evoked through this: the uncertainty of whether our love has changed in character, the excitement of fond memories, the cheeky smirks of knowing what one might get up to, the fear that a change in appearance may unmoor previous sureties. Entwined is an experience, an emotional journey that would resonate with even the coldest of hearts owing to its multifaceted approach to telling the tale of loves that have had to be worked for. The optimism of the end of the game is also something that could bring hope to even the most cynical. It’s trite and smacks of the youth of its development team in its optimism, but the inexorable charm of the thing shines through. Entwined simply is love.